The Anandapur College is situated on the bank -of the sacred river Baitarani. The College completes its fourty-five years of existence, fulfilling the long cherished desire of the people of this sub-division for higher education. The pioneering efforts of Sri A.C. Dehury, then the S.D.O. Anandapur, benevolent efforts of some young gentleman of the locality, generous contributions of the people of Anandapur and financial help received from all the Panchayats under the sub-division brought the long cherished dream of the public of the locality into a reality. The College originally started functioning in Ananda Bhawan, the Town Hall of Anandapur, in the month of July, 1964 with a strength of only 90 students and 6 lecturers. After about 3 years the College was finally shifted to the present site where a number of buildings have now come up. 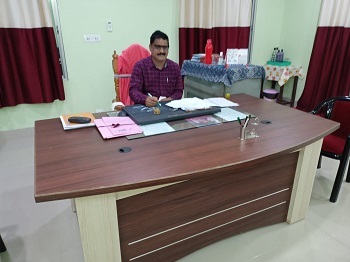 The College has been steadily progressing and expanding in all respects due to the efficient management of the successive Governing Bodies, various awards received from the State Government and co-operation of the people of the sub-division. It is now a full fledged degree college in Arts, Science and Commerce with Honours teaching facility in English, Odia, Economics, History, Political Science, Sanskrit, Philosophy, Mathematics, Chemistry, Physics, Botany, Zoology and Commerce. The strength of the students has gone up to 2000 and that of the teaching staff has increased to 52. The College provides three hostels, one for the Schedule Caste and Schedule Tribe, another for the General Students and the third for the College girls. The College has also been providing sustainable support to a large number of scholars from amongst the teaching fraternity in their research works. Over the years a good number of teachers of the College have been awarded M.Phil. and PhD Degrees in Arts, Science and Commerce. Moreover many teachers are presently engaged in higher research work. Copyright @ 2016 Anandapur College | Powered by: Easy Technologies Pvt. Ltd.